Franklin Monroe Jets 2019 varsity baseball team and coaches. 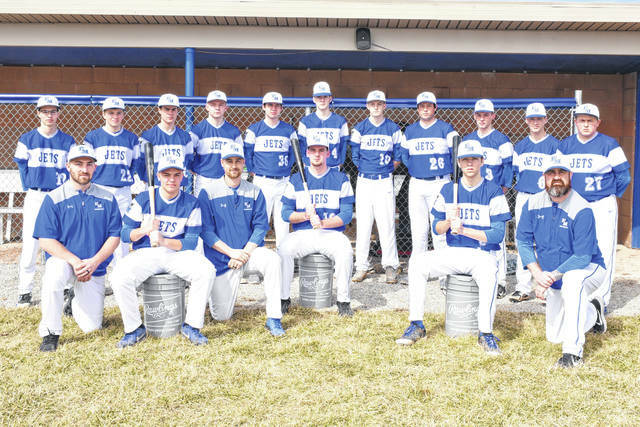 PITSBURG – Franklin Monroe baseball will be short on experience this year after graduating 6 players from last year, all were starters for the program. With only 5 guys returning and two of them with significant experience the Jets will be young and inexperienced with several new guys, and a new coaching staff. Taking the lead this year will be Athletic Director Tyler Rhodus who has experience as a coach with Wilmington High School and he will be assisted by Tim Sargent, Logan Ressler and Ethan Nealeigh. Timothy Lawson is a 6’2” senior infielder, starting pitcher last year and will be a middle of the order guy who can play several positions. Larkin Ressler is a 6’0” senior pitcher and middle infielder who was the starting 2nd basemen last year and will spend most of his time at SS and 2nd this year. He is a guy FM will rely on at the plate as well. Caden Goins is a 6’0” junior outfielder and pitcher who started most of the season last year. The Jets are excited to see what Caden can do on the mound this year. He only pitched 15 innings last year and will throw much more this year. Parker Schaar is a 5’10” sophomore outfielder and played limited time as a freshman. He has made large strides so far this year, especially at the plate. Brendan Hosler is a 6’1” catcher and pitcher who pitched 20 innings last year and will be expected to throw a lot more this year. He also will so a lot of playing time as well. Rounding out the roster will be senior Ethan Coppess, juniors Dalton Goubeaux, Jarin Young, sophomores Cavin Baker, Jacob Winterrowd, and freshman Gabe Sargent, Cameron Barga, Dylan Brumbaugh and Blake Sease. Coach Rhodus and his staff know it will take time to get up to speed but they are ready for the challenge. “Obviously we will be young and inexperienced for high school varsity baseball by having several new guys, and a new coaching staff, it will take time to get up to speed with what varsity baseball should look like. I am really pleased with our ball club with how focused and motivated they have been up to this point on getting better every day,” Coach Rhodus said. “Being my 1st year here as the head coach and just getting a few more guys out now that the winter season has ended, we are still figuring things out, one thing I am pleased with is our flexibility. We have several guys who I think can play multiple positions and several guys we can put on the mound. I do think a couple of our strengths is leadership and team chemistry. The older guys are doing a really nice job of owning the responsibility of leading this ball club.” Rhodus added. “I will be learning a lot this year about other teams. Tri-County North, National Trail and Arcanum all bring back the majority of their teams from last year and Newton was the league champs but graduated 3 guys who were their top arms and a Short Stop, while Mississinawa Valley has Trent Collins who could be one of the top arms in the league this year,” Rhodus stated. The Jets have the right attitude and only time will tell but nothing less than competing and improving each day will be acceptable to the coaching staff. “Our goal is to win as many games as possible and to improve each day. We are going to try and win ball games, and ultimately, I want to see our team compete every time out and never get too high or too low, “Trust the Process” it’s a cliché term – I know – but I think that is true with this group of guys. We need to keep in mind the big picture – improve our games each day and not let game results (win or lose) change our mentality. Too many times I’ve seen winning teams become content or losing teams shut down and quit. I think if we can keep the right mentality, we will have success as a team,” Rhodus concluded. https://www.dailyadvocate.com/wp-content/uploads/sites/34/2019/03/web1_FM-BB-8-inches.jpgFranklin Monroe Jets 2019 varsity baseball team and coaches.